Invertebrates are animals without backbones. This simple definition hides the tremendous diversity found within this group which includes protozoa (single-celled animals), corals, sponges, sea urchins, starfish, sand dollars, worms, snails, clams, spiders, crabs, and insects. 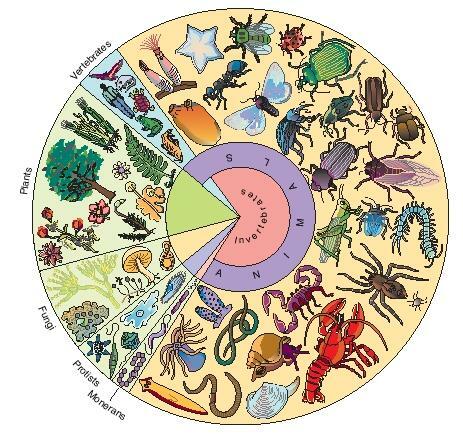 In fact, more than 98 percent of the nearly two million described species are invertebrates. They range in size from less than one millimeter to several meters long. Invertebrates display a fascinating diversity of body forms, means of locomotion, and feeding habits. Invertebrates are ectotherms (cold-blooded): they warm their bodies by absorbing heat from their surroundings. Most invertebrates live in water or spend at least some part of their life in water. The external layers of aquatic invertebrates are generally thin and permeable to water. This structure allows the ready exchange of gases needed to keep the animal alive. Some aquatic vertebrates do have specialized respiratory (breathing) structures on their body surface. Aquatic invertebrates feed by ingesting their prey directly, by filter feeding, or by actively capturing prey. Some groups of invertebrates live on land. Common examples include the earthworms, insects, and spiders. These invertebrates need to have special structures to deal with life on land. For example, earthworms have strong muscles for crawling and burrowing and, since drying out on land is a problem for them, they secrete mucous to keep their bodies moist. Insects and spiders move by means of several pairs of legs and are waterproof. Good and so nice so it is so very very good for all the people, all aliens,and all living things even planets too. This website is awesome! I definitely come here again when I need information! I really do recomend this website! hi,its me again,Coleen,we wil have a report in sept 9 tues.and i need to have pctures of invertebrates an poriferans,coelenterates and worms to have the highest score pls. help me! This article is pretty good i liket as a student that i am i'm gonne use it as a reference in my project at school. am a university student. am taking invertebrates as unit.i enjoy it. A perfectly well explained example on invertebrates, thanks to just by reading the first paragraph I could give well explained answers for my grade 12 biology class.